Week two has started and we have begun to cook! 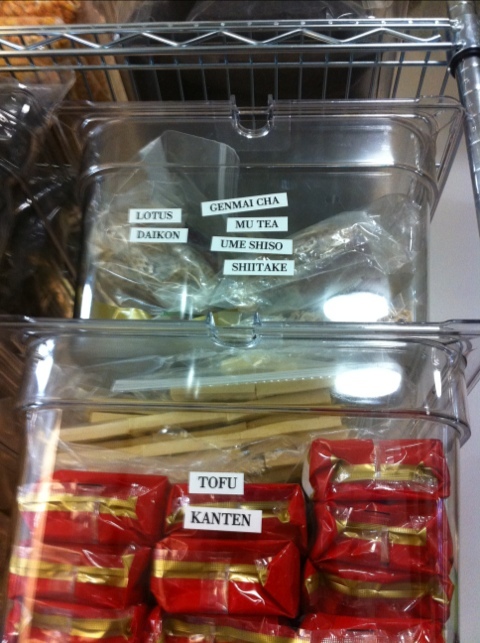 So far this week we’ve cooked some stocks and sauces. Stocks are essentially water simmered with vegetables and aromatic herbs and spices. For those so inclined, stocks may also include animal bones and other parts. The water is imparted with flavor and the resulting stock is used to make soups, sauces, or in other cooking applications. 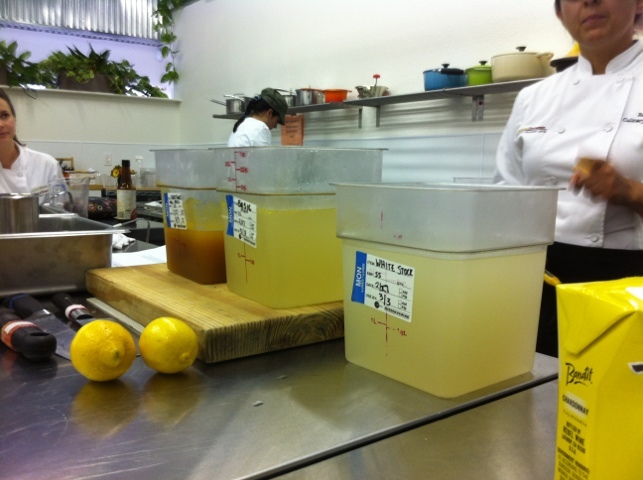 Below: Chef Rosa shows us three completed stocks of varying colors, which come from the ways the stocks were prepared and/or the ingredients used. 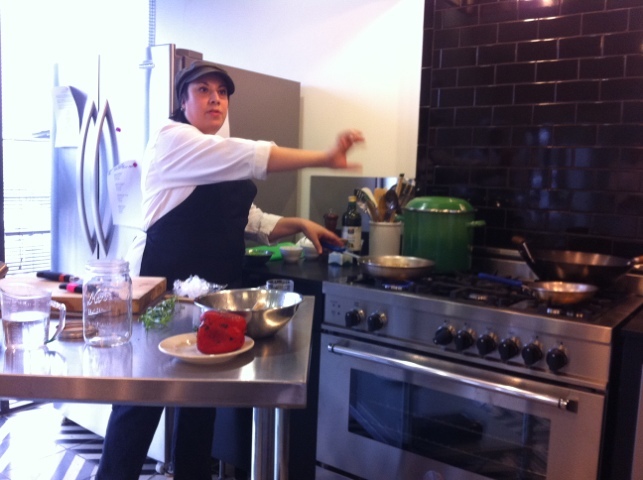 Below: Chef Rosa demonstrates assembling a sachet of herbs for a stock. This image is from the demo portion of our day. 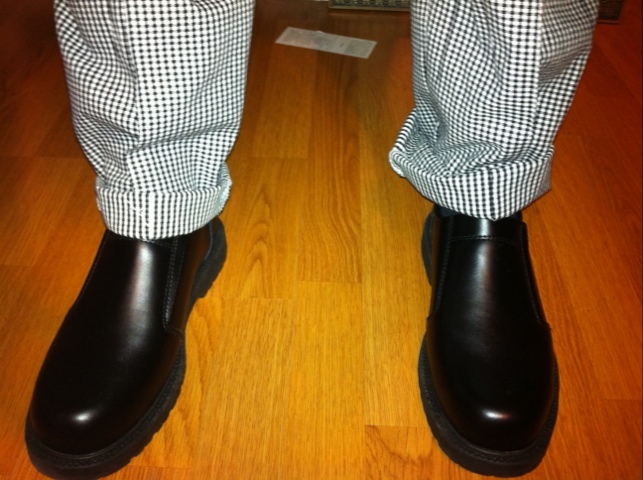 Each day is divided into two parts, a demonstration (“demo”) half and a lab half. The lab half is where we cook and the demo half is mostly observing. Below: I decided to try making a stock at home to complement a potato soup I made, so I simmered 2 quarts of water with leeks, onion, and garlic. 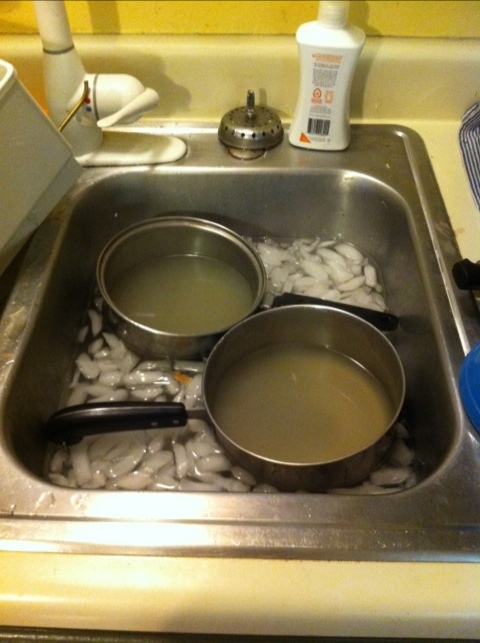 Here’s the stock cooling in an ice bath. Below: Chef Alex doing a quick demo before our lab on sauces. After the introduction to a lab session, the instructor turns us loose on our recipe(s) for that lab session, walking around and providing guidance as needed. Below: Mmm…some minced onion sauteing nicely. 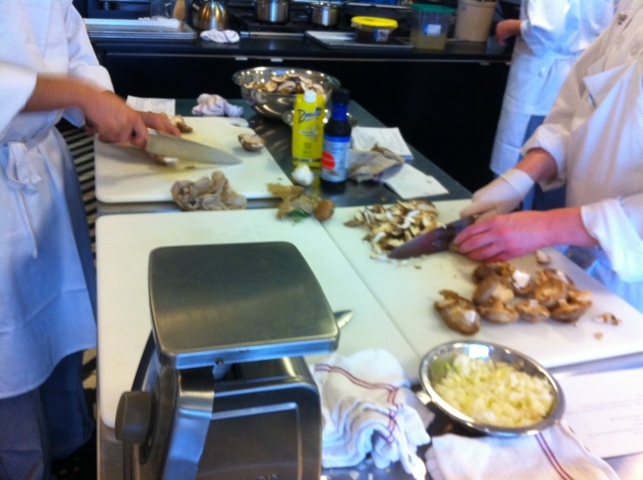 Below: Team dashi slicing mushrooms. 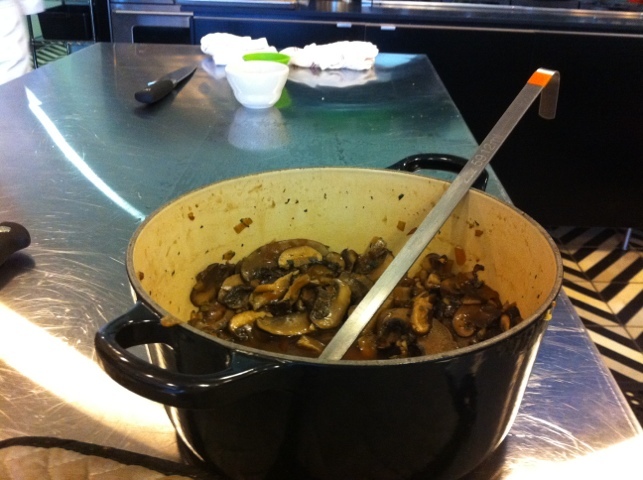 Below: The mushroom jus was one of my favorites from the sauces lab day (Tuesday) – rich with tender and earthy mushrooms. The foundation of this was the good mushroom stock made the day prior. 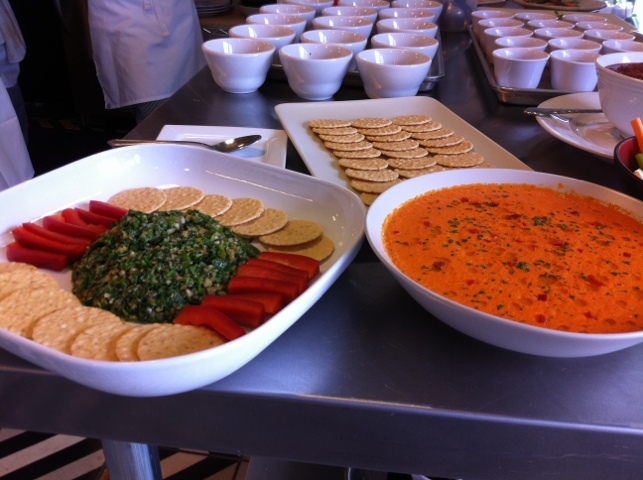 Below: A terrific salsa verde (parsley and walnut, in this case) and roasted red pepper coulis. Both had colorful and enticing presentations. 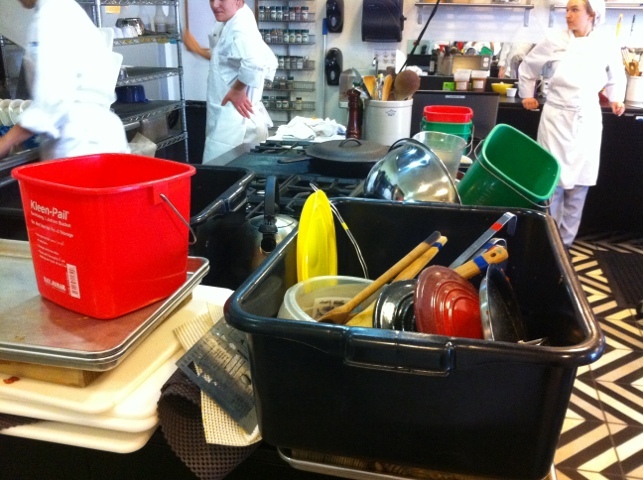 Below: Dishes pile up in the kitchen. We take turns doing the dishes, but everyone in the kitchen is responsible for various aspects of cleanup after a lab session. Below: A tasting after the demonstration on sauces. 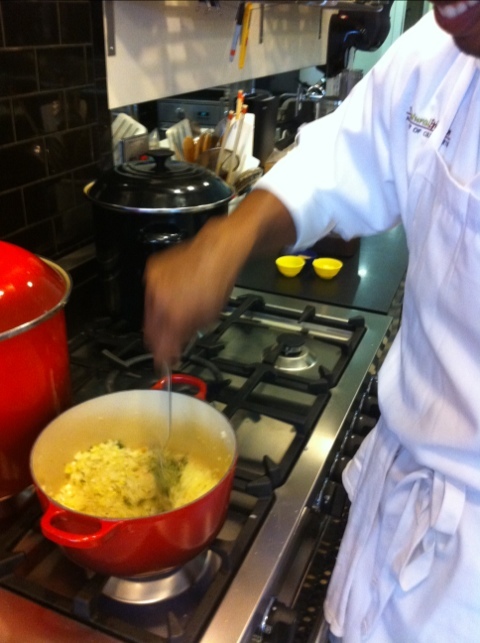 Chef Rosa prepared several sauces including bechamel and hollandaise for tasting. Sauces were a bit of a bummer for me because they typically contain either butter (dairy) or wheat (gluten), both of which seem to give me trouble. Nevertheless, Chef Rosa showed us versions without dairy and I’m optimistic about learning more about gluten-free sauce options. 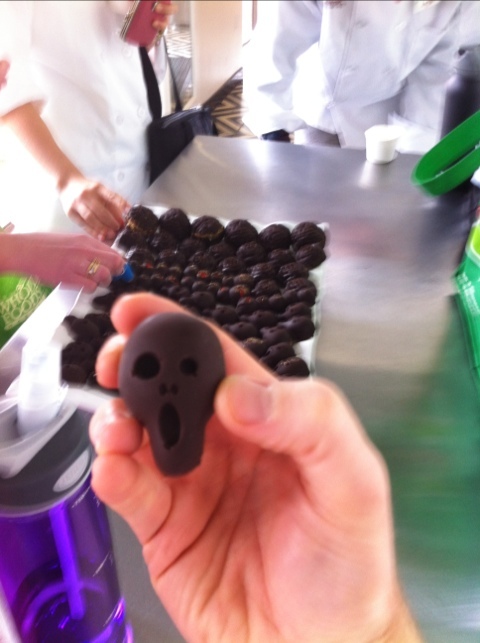 Below: Just for fun, a lovely and delicious chocolate made by my classmate Kim Gallogly. An American expatriot, Elizabeth Andoh has been called the Julia Child of Japan by NPR and others. She is in Austin doing some presentations in connection with her new book, KIBO: Recipes and Stories from Japan’s Tohoku. 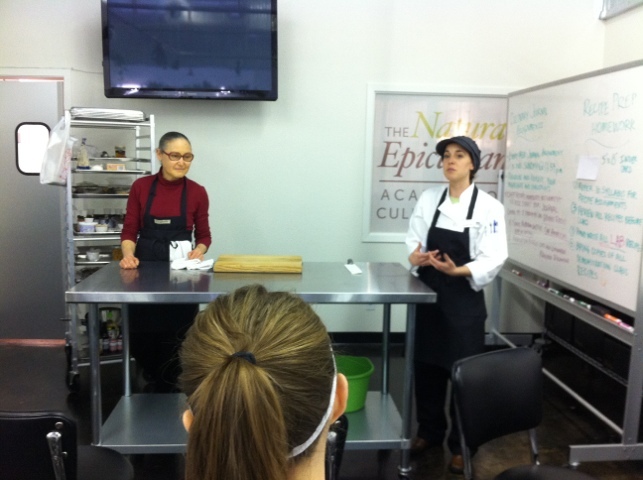 She graced us with a three-hour demonstration and lesson on Japanese cuisine this Friday after the morning session. Andoh has been living in Japan for 40 years and has mastered the art of the local cuisines. 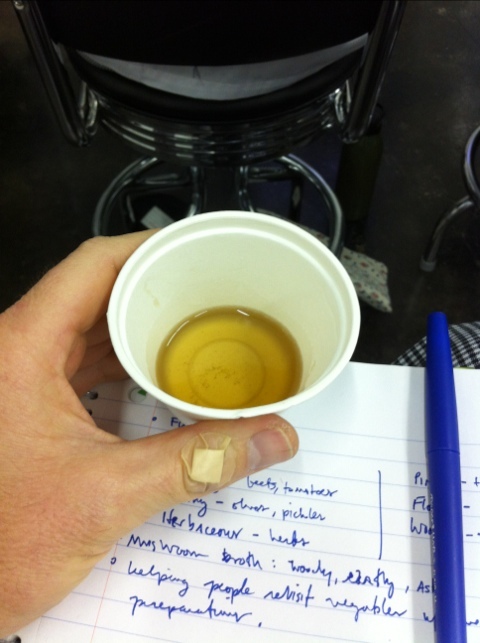 She gave us tastings of several broths and a wonderful rice morsel. I was so impressed by her passion and knowledge of Japanese cooking that I bought a copy of Washoku, Andoh’s 2005 collection of Japanese home recipes. The presentation followed our Friday lecture on flavors, which was appropriate because we discussed all of the elements of “flavor,” such as taste, aroma, color, texture, and much more, all of which were covered by Andoh. 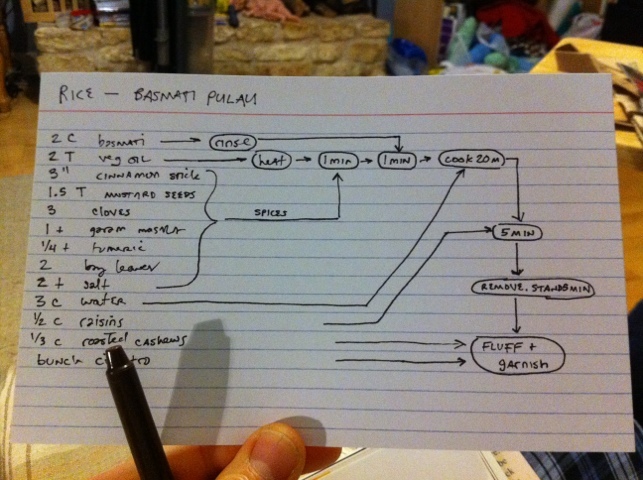 I acquire and process information fastest when it’s presented visually. So, I took a stab at these visual recipe cards. 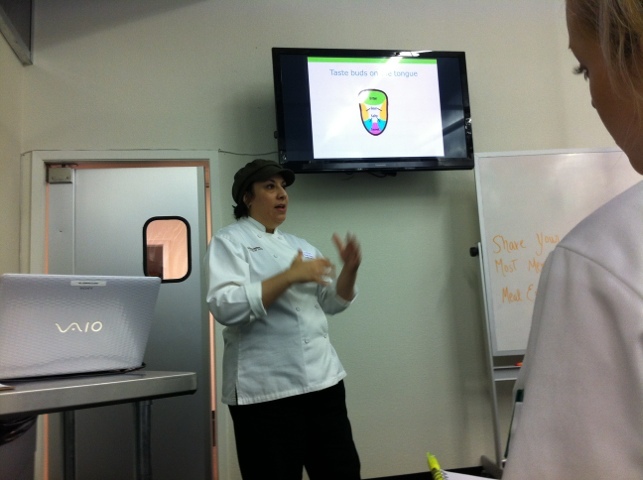 Today we had a lecture on flavors – a terrific topic for our first week of culinary school. Understanding flavor has been something of interest to me for a little while now (see this post on flavor). Nevertheless, I have a long way to go in educating my palate and improving my skills as a taster. It was very encouraging to hear Chef Alex, who was very close to earning a slot in the last Top Chef season, say that you can teach your palate through conscious eating and food exploration. It sounds fun, but it seems to require a real sense of purpose and focus. We practiced this focus by experiencing several tastings in sequence: apples, apples with salt, apples with sugar, tomato, mushroom broths, etc. We practiced using descriptive words: earthy, grassy, cool, crisp, etc. 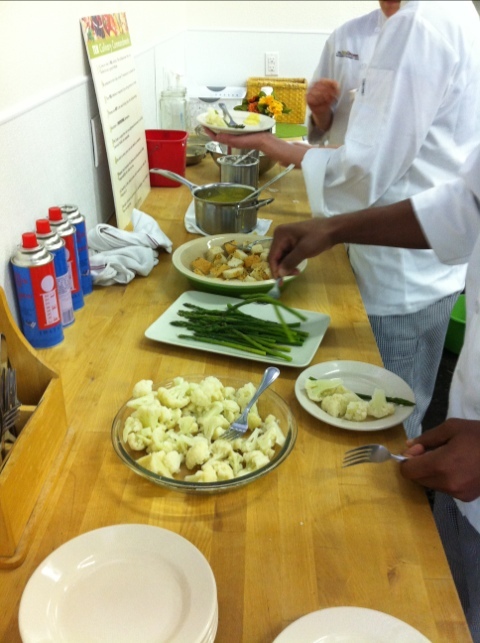 To be proper culinarians we will have to cultivate our abilities to draw others in with verbal descriptions of food. Below: A couple of the tastings from today’s class. It was Day Three and it feels like Week Three because of how much is going through my mind. It’s a good thing – life is filled with possibility. 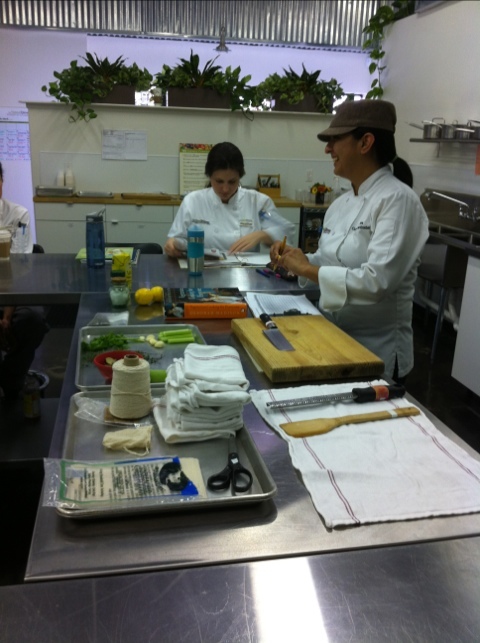 Ah, knife skills day one! This most basic of chef talents was something I didn’t expect so soon, but I welcomed it with enthusiasm. 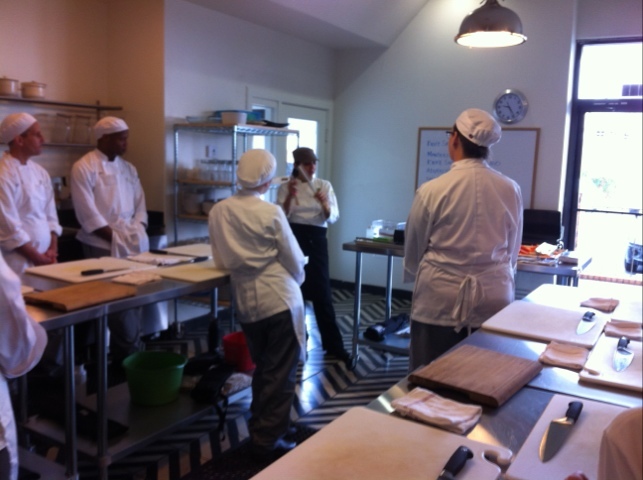 Chef Rosa is a terrific instructor and so positive! She strikes a great balance by upholding standards but also showing lots of flexibility and encouragement. One thing that struck me was that she said it took her three years to feel fully comfortable with knife skills in a professional culinary setting, which is to say that we all have a lot to learn. 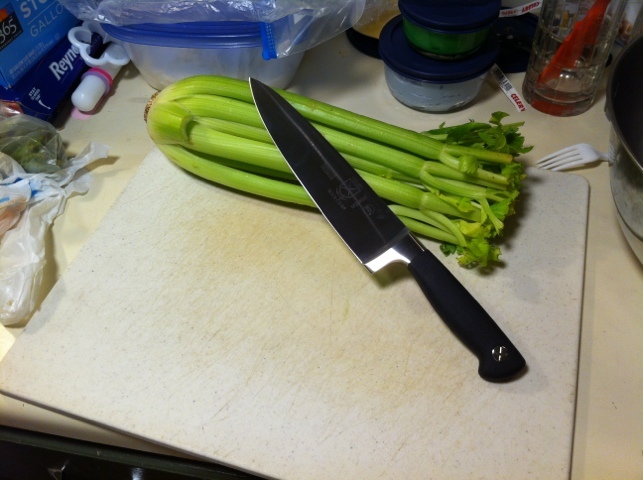 Everyone took their time striving for the ideal battonet and large dice cuts – it’s much harder than you’d think because each cut requires fairly specific dimensions (e.g., a proper julienne is .125 in x .125 in x 2.0 in.). 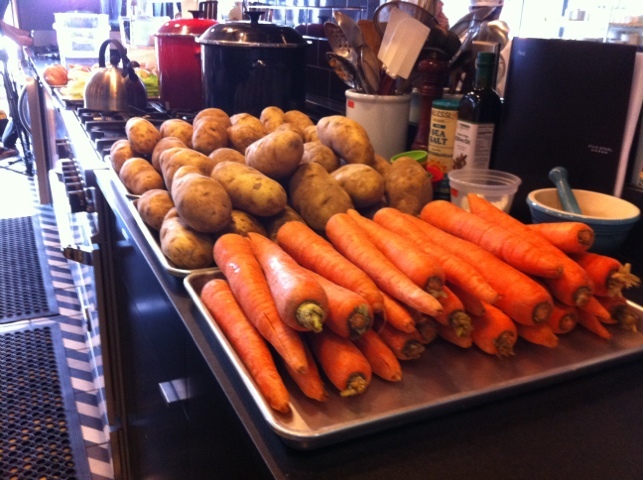 Below: Vegetables for the choppin’! These were prepared by one of the kitchen assistants – a recent graduate who is working on her assisting hours for the school. 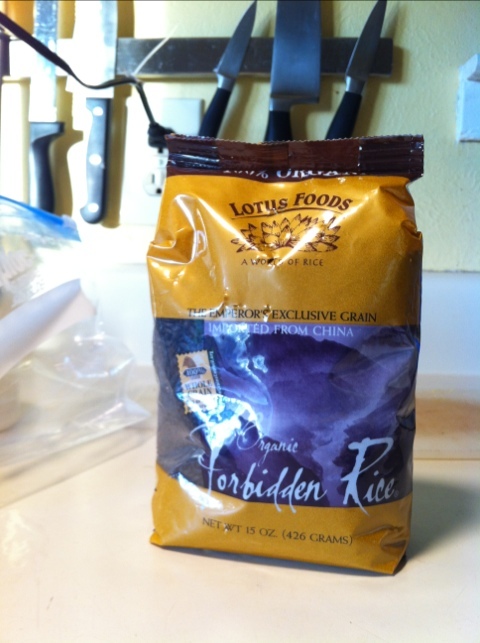 I’ve been wanting to try forbidden rice for a while. 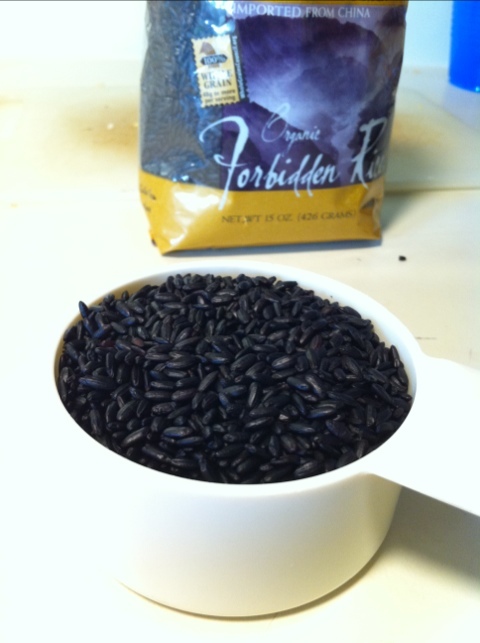 Forbidden rice is a variety of rice that seems to come from China that’s known for it’s deep purple — almost black — color. 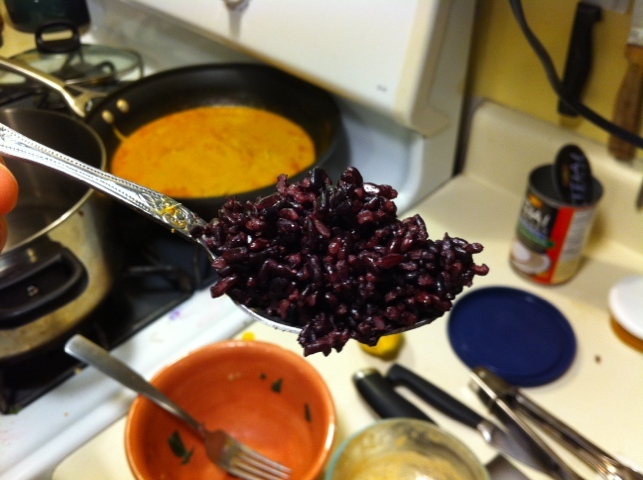 The rice has a typically mild flavor, although it’s slightly nuttier than typical rice. 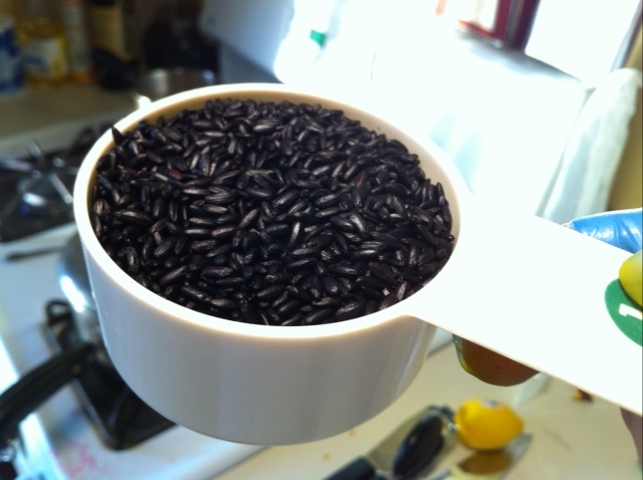 Forbidden rice is reportedly higher in the same blue-tinted antioxidants found in blueberries and other blue/purple plants, except in higher quantities. 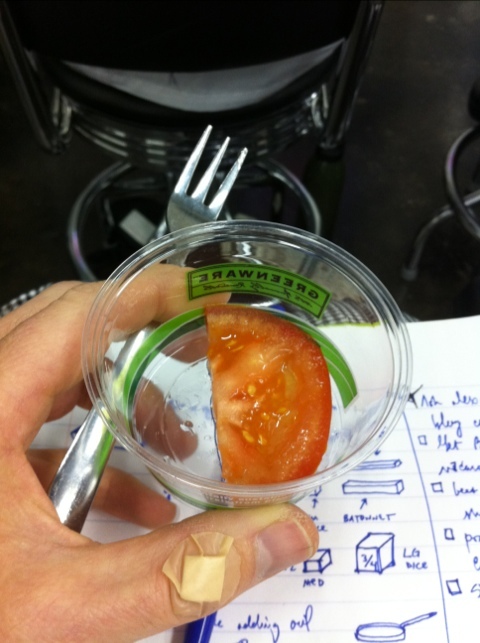 The day started with tying up the food handling class, then we took our test. Pretty straightforward. I’m really enjoying getting to know my fellow classmates, and I feel like I’m starting to make some good connections. We’re about to break the class into two groups, which is kind of a bummer since some cool people will not be in my group. Hopefully, it won’t impair my ability to get to know everyone well, since all of the students seem to be pretty awesome. Tomorrow we start Knife Skills, so I thought I would try one of my new knives. I made a Waldorf Salad, which required a semi-fine julienne of apples with chopped celery, and chopped some vegetables to roast. The salad turned out great; the roasted vegetables, meh. I have a bit to learn about roasting veggies. According to Amazon.com, the Mercer lists for about twice as much cost as the Calphalon. It would seem that The Natural Epicurean has good taste in knives! 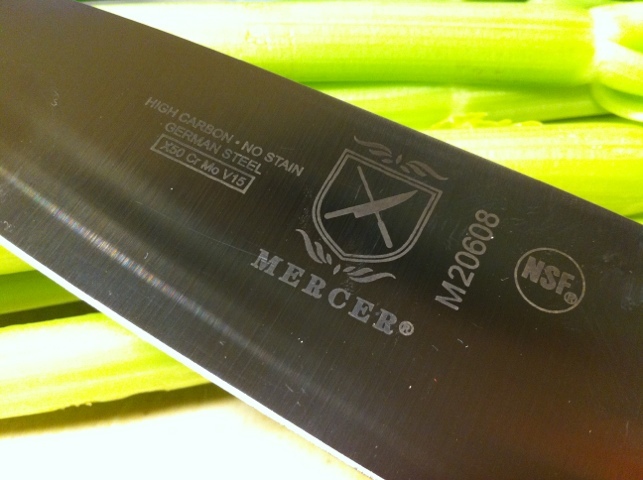 Below: My school-supplied Mercer 8″ chef knife. 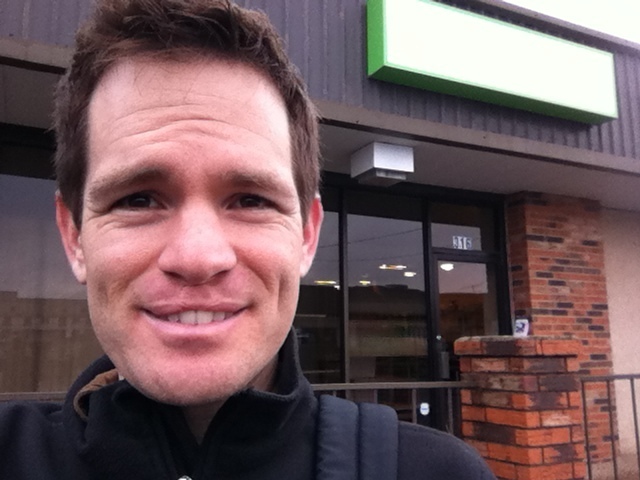 Yesterday was my orientation at The Natural Epicurean, and it was an excellent morning. The purpose of the orientation was to learn some of the basics that we would need to become students and to take care of some housekeeping things. We got to hear from Maya Farnsworth, Ken Rubin, and David McIntyre. 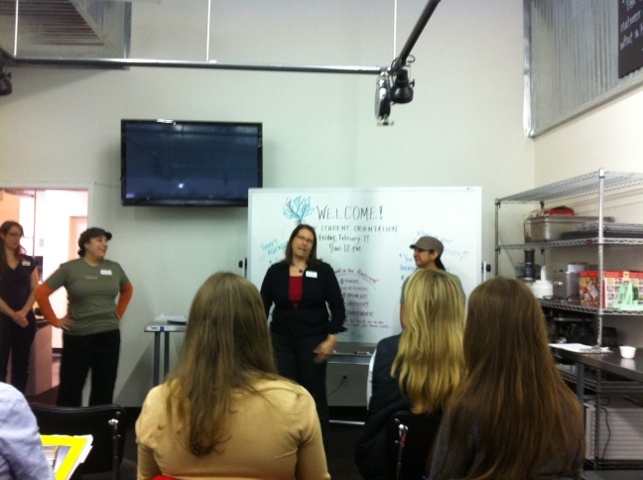 We got introductions to Chef Rosa and Chef Alex, the lead instructors. We heard from curriculum director Ellen Stansell, procurement manager Brian Henderson, and others. I was impressed by the quality of the team helping to make things go well. Everyone is eminently qualified for their role. Below: Chef Maya doing staff introductions. I was especially inspired when Ken talked about the mission of the school and each of our personal missions. He talked about letting your passion for healthful eating drive you and to share it with others. That it becomes so much a part of you that you love to tell others about it. It is truly amazing what a diverse and excited group of students I’ll be working with. We have students from Miami, Santa Fe, San Francisco, San Diego, Tuscon, Pennsylvania, Massachusetts, and many other places. I do believe I am in the minority being from Austin. We have vegetarians, vegans, and omnivores. Some of us have food allergies and sensitivities, like I do. 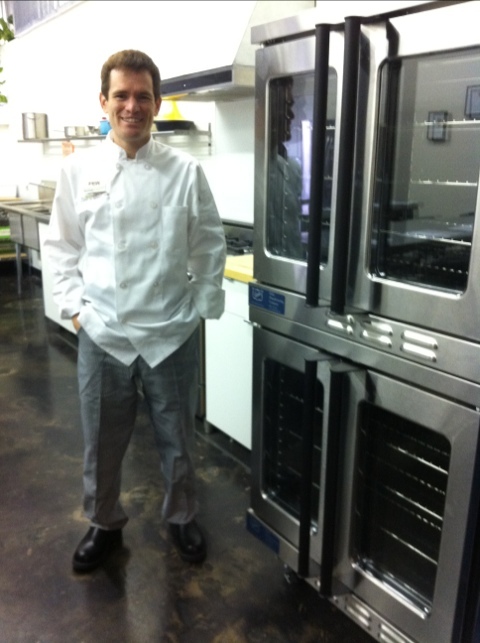 The group includes artists, at least one trained pastry chef, and former business professionals. Like me, not everyone is certain where this journey will take them. It was very exciting to see so many people from many walks of life come together for this common purpose. I made some good initial connections with a few students. 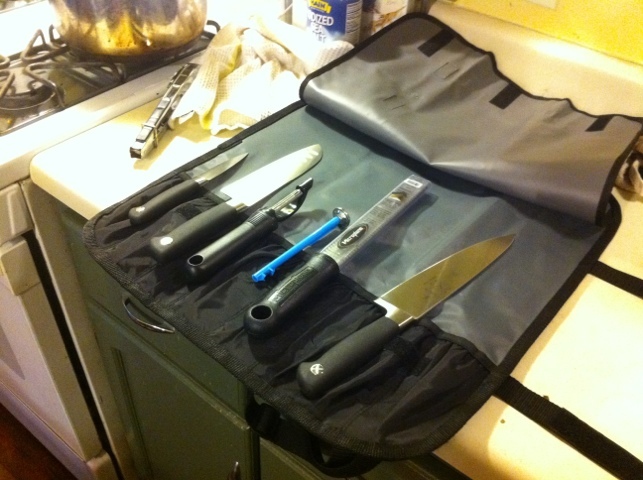 Each student was given a Mercer knife kit, which will help ensure we are all using quality equipment. I feel very “professional” now. 🙂 Each student got two chef coats (pictures coming later) with The Natural Epicurean logo. Curriculum director Ellen Stansell gave us an orientation to the Canvas Learning Management System (LMS). This is where we can download course materials and view announcements related to the program. It’s the starting point for our course experience. I love Ellen’s approach because before she started her tutorial, she had everyone stand up, take deep breaths, and raise our arms up over our heads. 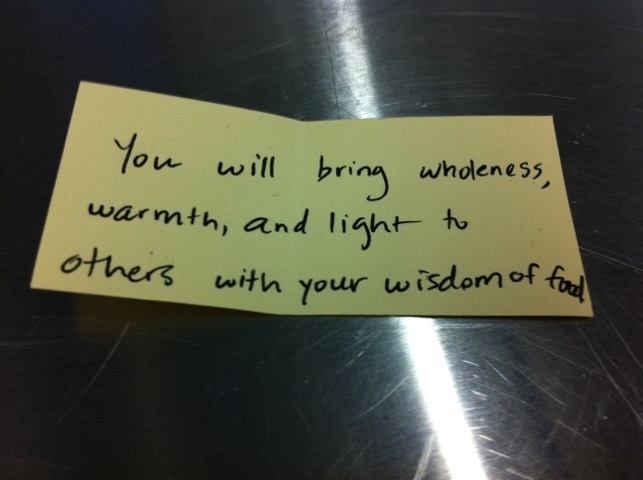 It was delightful to have someone attending to our physical comfort and the mind-body interaction. That is very unusual, unfortunately, but most welcome. I spoke to Ellen briefly while picking up my chef hats and she seems like a terrific person, as does everyone I’ve come into contact. I paid my tuition during orientation, also. It was largest check I’ve ever written in my life (the down payment on my houses were cashier’s checks, so they don’t count). I had no hesitation about the cost of the program whatsoever. I viewed it as a check I was writing to myself – investing in my future, my happiness, and my own well-being. It will be repaid to me many times over in learning, in career satisfaction, in financial gain, and in my own personal health. I took a few photos of what lies behind the curtain, since it was my time going beyond the front rooms of the school. 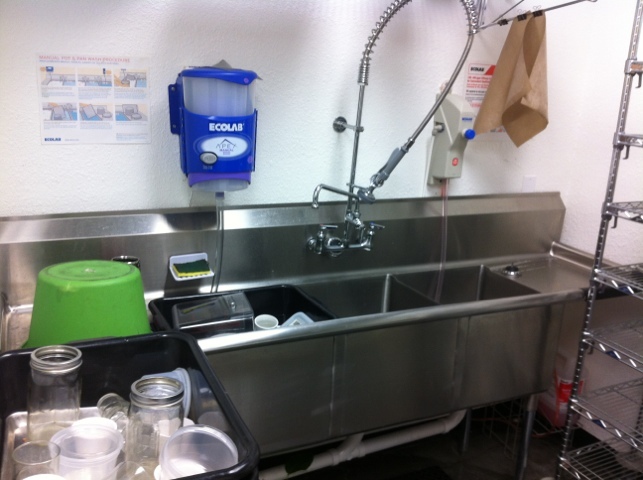 Below: The dish washing area. 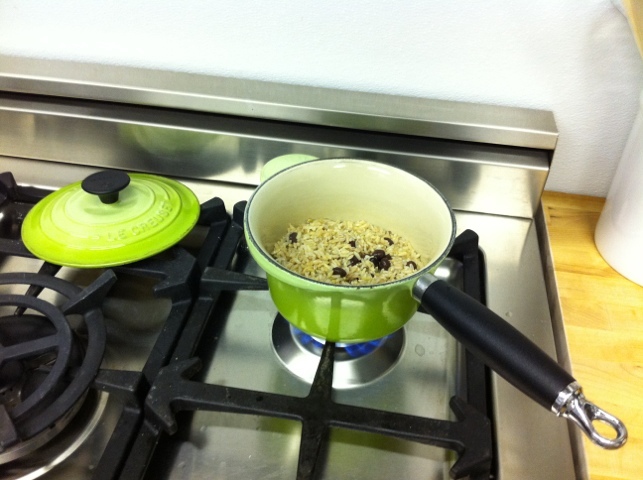 A critical part of the cooking process. 🙂 You may think I am strange, but I’ve always appreciated the zen of washing dishes by hand. Below: Some fun ingredients waiting for my expert attention. 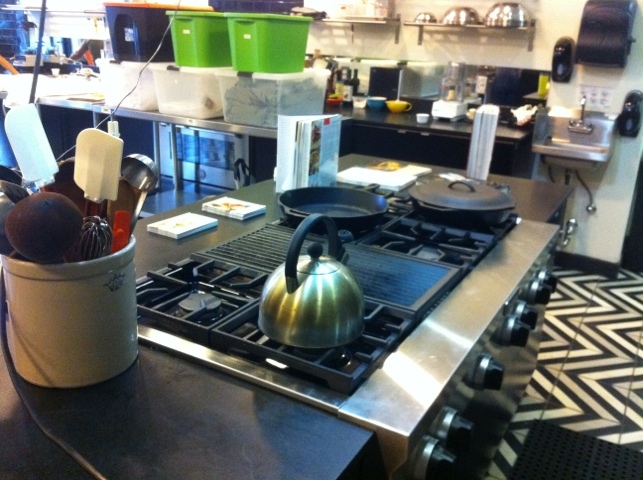 Below: The main teacher’s cook station. 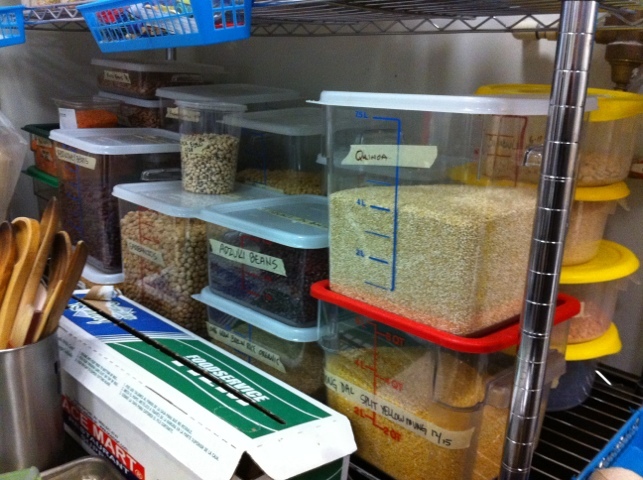 Below: Various beans, some quinoa, and dal. This day took one year to plan and make happen, but it has been 34 years of preparation. It was a wonderful gift to myself to be able to be in the presence of so many who share my same desires and goals. There is a lot of energy in the air and I am very much looking forward to this journey.